Cognitive Science represents an interdisciplinary field of research in the domains of philosophy of mind, cognitive psychology, cognitive neuroscience, psycholinguistics, AI theory, cognitive anthropology and other disciplines. Its origins can be traced back to the fifties, when researchers in various disciplines started developing theories based on complex mental representations and computational procedures (the computational theory of mind). In mid-1970s, the first Cognitive Science Society was founded, followed by the first cognitive journal named Cognitive Science. Since then, over 70 universities around the globe have formed curricula focused on cognitive science(s). 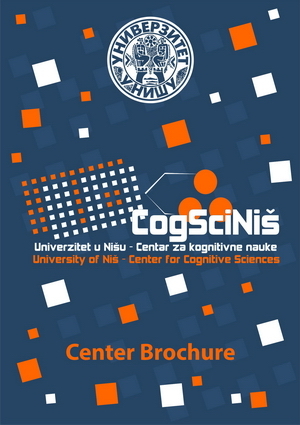 In Niš, various researchers employ a cognitive approach in the domains of neurology, psychiatry, linguistics, psychology and electronic engineering. So far, there have been no instutionalized forms of cooperation among them. The main aim of this project will be to promote interdisciplinary cooperation in the field of cognitive science by organizing meetings, seminars and lectures, as well as by initiating international cooperation with various institutions and creating an academic curriculum fully devoted to cognitive science. The Center's activities will involve not only academic staff, but also a number of students interested in the field. Center for Cognitive Sciences was founded in July 2013. Its formation had been initiated by the Cognitive Science Forum. Center for Cognitive Sciences is a member of the Cognitive Science, Knowledge Studies, and Knowledge Technologies CEEPUS III Academic Network.